Once an order has been placed, no changes can be made. The order would have to be canceled and a new order placed. 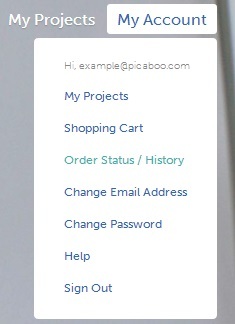 Picaboo allows you to cancel any order within 30 minutes of placement. After the 30 minute window, your order will be entered into production and it will no longer be possible to cancel it. Click the link that says “cancel your order” on the confirmation screen, which will take you to the cancellation web page. If you have closed your software already, check your email and open up your order confirmation; it should be in your inbox within a couple minutes of placing your order. In that confirmation email, click the “cancel your order” link. You can also reach this page by clicking here. Alternatively, you can click on Order Status/History from the My Account menu in the upper right on our homepage. Log in with your account information when prompted. You will then be taken to a page that displays all orders for your account. Note the sections on the right show the current Status of the order. Any actions that can be taken against the order will be listed on the far right, under Actions. If you're still within the 30 minute time limit, click on Cancel there under the Actions. The next screen you'll be taken to contains a survey to ask the reason for the cancellation. Once you've selected a reason, click on the Cancel Order button below. Important: Your order will not be canceled until the directions below are completed as well. Once you've successfully canceled the order, you'll see a confirmation on your screen, and a cancellation email will be sent to you automatically. Note: Because payment information must be submitted to your bank immediately when placing an order, you will still see a charge for your order appear even if it has been canceled. That charge will be refunded or reversed within 1-2 business days of order cancellation. If you have any trouble when canceling your order, please contact us as soon as possible. Please note that we cannot take cancellation requests through email.